Halloween, that scary fun time of the year is here again! And naturally, everyone is talking about Halloween tattoos- cute small or medium sized Halloween tattoos that you can put on your face, arm or leg. Originally coined from the ancient Celtic festival called Samhain, Halloween is a holiday that falls between fall and winter. It’s believed that Halloween straddles, plenty and paucity, loss and gain, and life and death. As a result, people would light bonfires and wear costumes to ward off roaming ghosts who intend to take them to the underworld. It was a real time of terror. Nowadays, it has been affected and molded by time, customs and religion and has become a holiday of pure fun and excitement. The terror part is still present though, but things are generally less macabre. If you love Halloween as much as I do, your preparations for an exciting time would already be in top gear by now. Have you gone costume shopping or you’re just gonna rent one? Decide now already. What about your gadgets- are they Halloween themed? You can also check this post for a great collection of Halloween wallpapers and backgrounds for your laptops, IPads, tablets and smartphones. How about tattoos? Will you get one? You should if you haven’t. Tattoos are fun and Halloween ones are no different. You could get a really scary one to spook your friends. Shivers. One important thing to note though: you can opt for a temporary Halloween tattoo unless you want to wear it forever. 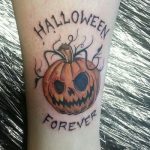 I’ve pieced together some pictures of cute and spooky Halloween themed tattoos which you will want to put on your body in 2016. If they’re not exactly what you’re looking for, they’ll definitely inspire you to get creative about what you want…. and it doesn’t matter if you’ve got one already, you can still get another one! Here’s a lovely, simple and cute Halloween ghost who is always ready to give you a treat. I don’t think he’d trick you though, just look at his goofy smile. Here’s the total Halloween tattoo lover. A brilliant work of art. Cool full body Halloween tattoo. This kid is certainly not from this world…and ghosts will be afraid whenever they see him. Brilliant idea here. You shook your hands out to shake someone, and BOOM! they’re petrified. The pumpkins and scarecrows are doing the same job here. The pumpkins are more effective than the scarecrow, I must say. A Nightmare Before Christmas tattoo. Looks cute, though. It seems they’re in love. Creepy love. This cute little tattoo could pass for an ID card for witches. The wicked witch and her angry possessed pumpkins. Cool, huh? Oh my! This is a horrific Halloween scene. Judgement Day in Pumpkin land. Gives me the creeps. Shut your doors, close your windows. Looks like a ghost pumpkin just escaped from the graveyard. That wicked creature is eating all the treats, and the others are not happy about it one bit. Butterflies and a skull- perfect combo to get you out of your skin. This tattoo is cool, classy and has a tinge of scary too. A haunted castle overshadowed by a menacing bat and an orange moon. Things are about to get reaal spooky. This is a simple way to terrify someone. Classical. Cool. Beautiful. A haunted ghost is coming to haunt you…run for your lives. This tattoo is chic, exotic and spooky at the same time. Cool. So, here’s a pumpkin… and a scorpion! At first it looks harmless but if you look closely, you’d watch your steps. A reaal spooky creature here. Is it a tree? or the skeleton of an undead witch? Shivers. Here’s a very ugly zombie coming for you, with arms flailing and a blood-curdling scream. Now this is one huge spooky tattoo. I dare you to stare at that giant eye for one minute, and don’t avert your gaze, or call for your mama. This tree of scary pumpkins speaks Halloween in more ways than one. A nice idea here- the scary pumpkin is complete when the legs are together. This is how a female Frankenstein monster would look like. Don’t be drawn in by her beauty. She’s a monster. Some monsters are beautiful. Don’t be deceived. Looks like the witch is busy doing something evil. If you’re into witches and wizardry, this tattoo is for you. This tattoo of a mummy cat seating on a haunted pumpkin will surely send its onlookers into a fit of fear. What’s that dripping from its mouth? Ew! Spooky. A haunted house is on fire, and the pumpkins are laughing in an evil manner. Lord of the grave. That cat should be avoided at all costs. It bossed the grave, and made the evil pumpkins submit to its will. No one will be resting in peace there. Here’s a great Halloween carving on the stomach. It’s beautiful too, apart from being scary. The real Frankenstein monster. Howdy dude? Grrrr! Okay. Don’t be deceived by his kisses and apparent cuteness. That little boy is evil. Halloween Ghost. A mean way to scare your friends with this tattoo. An unreal pumpkin tattoo adorning on the hand. A perfect way to send shivers down someone’s spine. This little devil boy with ragged teeth and forlorn eye is going treat or tricking. He has a ghost and a sorry pumpkin as companions. A classical example of a perfect Halloween tattoo. Only for die-hard Halloween fans. Here’s an angry ghost with its crew of vicious bats, ghoulish ghosts and haunted pumpkins to scare off your enemies. 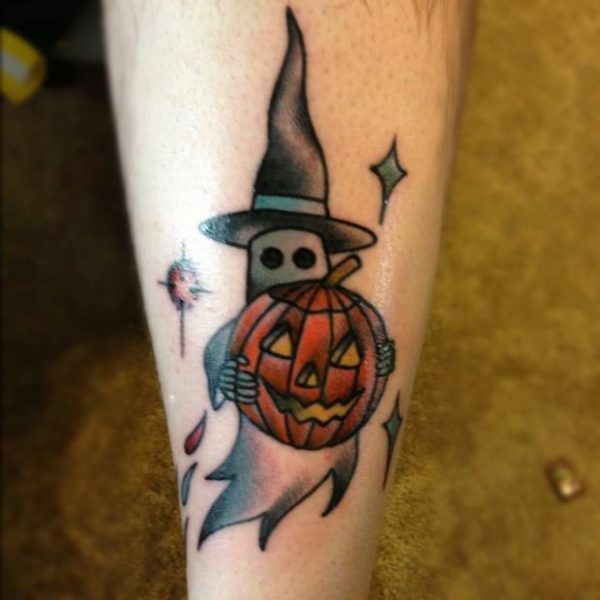 A simple smiling, yet scary pumpkin tattoo on the leg. Cool. Here’s another example of a scary pumpkin hand tattoo. This time with other creatures. Here’s a feet tattoo of a pumpkin with an eerie smile. That smile is evil, trust me. A little female pumpkin goes trick r treat’. She’s armed with a haunted look and that black bat isn’t hovering over her for nothing. Here’s a scary tattoo presented in a nice way. The bat is so in love with the pumpkin, and the ghosts are jealous. Everyday is Halloween. Yes. If you disagree, then you’d have a problem with this skull head. If I were you, I wouldn’t contradict him. A harvest of pumpkin spirits, by a scary looking skeleton. Or did that skeleton keep spirits inside a pumpkin. Either way, it’s a creepy scene. Shivers. A collection of Halloween items, both evil and sweet, on each finger. Sweet. Look closer. Stare for a minute, and you’ll realize the horror of this tattoo. It’s not cool, it’s evil. Okay. This is serious stuff. The atmosphere here is ominous, and the pumpkin holding that jagged-edged knife is more ominous. Great concept, though. Here’s a nice concept of a haunted house, on your shoulder. Cool. This is a little version of the Grim Reaper, in all its evil glory and might. The Frankenstein monster. Ha ha ha! Run for your lives!! This mummy has come to take you in your sleep. Hide under the sheets! That’s Stewie Griffin from Family Man. He’s still vicious and unfriendly, but this time around he’s also a zombie and an undead creature all joined together. Imagine all the havoc he’s going to cause. A scary pumpkin is back from the dead to avenge is age-long murder. It’s not happy, clearly belligerent and wants revenge. A perfect Halloween scene here. Flying witches. Haunted house, pumpkins, bats, and children trick r treat’. This is one evil looking pumpkin during trick r treating. This tattoo depicts a deathly buzzard scene, with everything looking gloomy and doomy. Is this a sacrifice scene or are those skeletons mourning a dead pumpkin? It’s nothing good, either way. A jack o lantern- scarecrow hybrid creature is keeping watch at a haunted house here. Visitors beware. This is a scary candyman, in the spirit of Halloween. These tattoos of Jack o lanterns from hell will send shivers down your spine. A graveyard Halloween scene, replete with haughty pumpkins, scary ghosts and bats. It’s an orange evening here. Complete with many pumpkins and jack o lanterns’ evil laughs and crows on dead tree branches. The undead in this tattoo is really scary and spooky. Two tricky pumpkins on the prowl here. Okay. This is serious stuff. Everything about this tattoo is scary and frightening. Here’s another scary tattoo. Very suitable for Halloween. Love. Skulls, flowers and a cross. Spooky stuff. No one should toy with this orange-eyed monster. It has a menacing look and speaks volumes of terror. A haunted vampire, with blood and what not dripping from her eyes and mouth. A baby from the underworld. Armed with an innocent look, an eerie smile and a wicked inner spirit. That’s right, it’s chuky tattoo. This little green monster feeds on human brains. Here’s a really vicious flaming red pumpkin, who is really not happy with anything or anyone. Zombies created this. Cries of the haunted. A gory story here. Tale from the crypt tattoo. This head is out to scare everyone off. The overall look is scary and that snarl will send shivers down your back. A scary zombie tattoo. Here’s Edward Scissors Hand tattoo to spook others. A scary night at the graveyard tattoo. This seemingly cute bat is not cute at all.